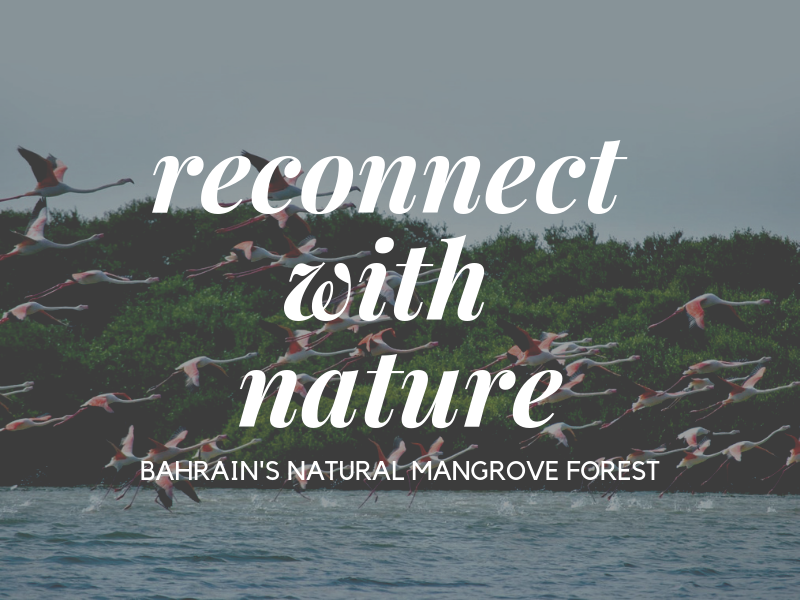 An initiative by Bahrain Tourism and Exhibition Authority (BTEA), the Bahrain Mangroves Tour is one of the ‘Must To Do’ things in Bahrain. 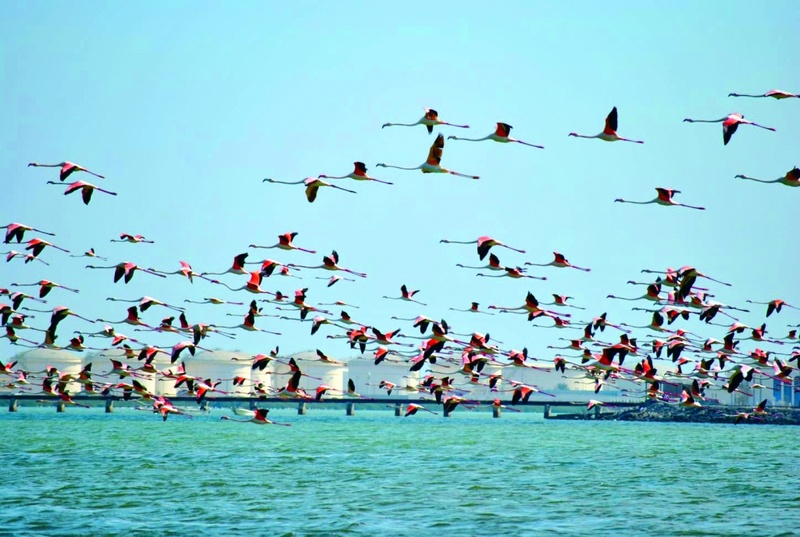 Located at the east of Bahrain between Bahrain Island and Sitra Island, Tubli Bay is known for rich marine and bird life protected by the mangrove forests. 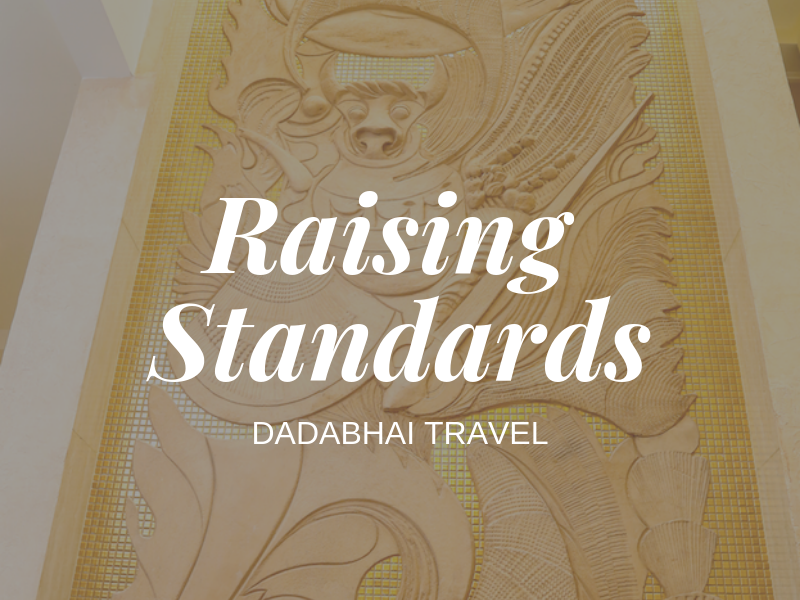 We had twice booked the tour before, but they were cancelled due to the low tide as the cruise solely depends on the water levels. Bahrain winter days set the ideal ambience for the mangrove tour as the cool breeze takes off the normalcy of the everyday life just as you enter the Sitra Park. The entrance to the tour is near the entrance of the walk. A few minutes of stroll along the sidewalk will prepare you to enter a totally different world in Bahrain away from the bustle and hustle. The crystal blue water and flapping waves ensured a good day as we started across. We crossed under the Sitra Overbridge towards Tubli Bay with the splendid views of Bahrain skyline. 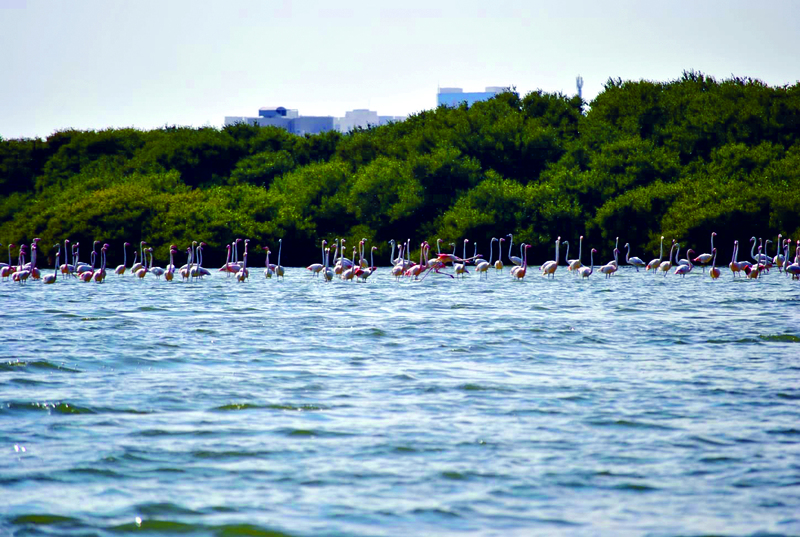 The outline of green mangroves became visible after 10 minutes of sail and as we went near a moving line of red and white spots came into sight. 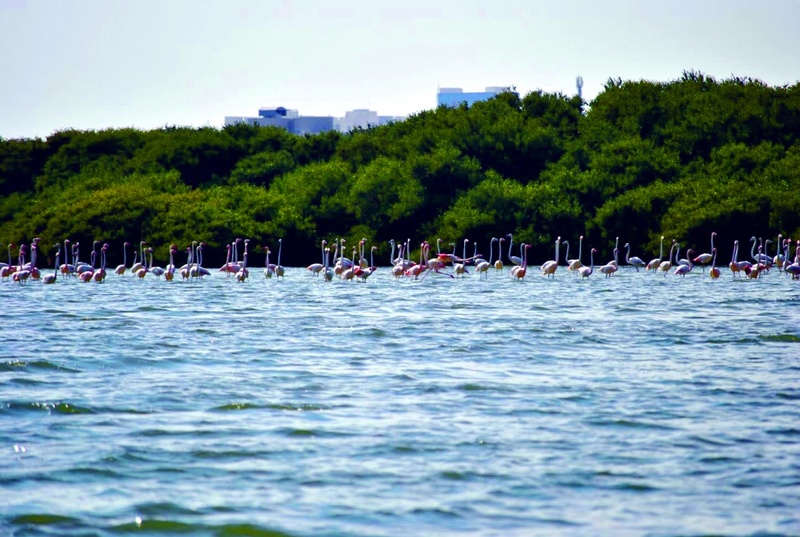 Our driver, Muneer asked us to steady the cameras and as the boat moved near the flaps began and a flock of flamingos streamed out on both sides of the boat in a circle. The moments had the natural mystic charm and I lowered the camera as I wanted to keep those moments in my mind. “It was like red and white flowers floating together in the sky!” Shreya exclaimed. As the narrow line before the mangroves waned, we entered into the mangroves. There was silence all along the jade green waterways and breeze stood still. 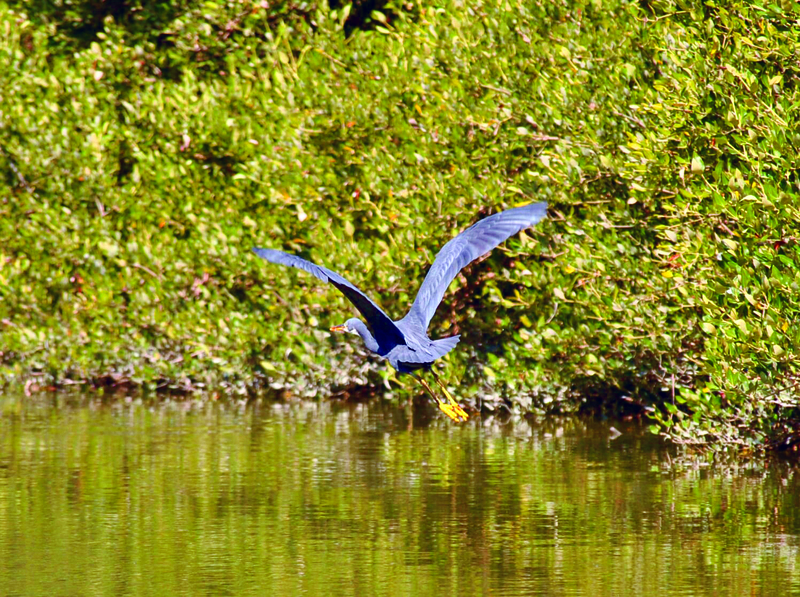 Now and then we heard wings flapping and some of the natural dwellers flew away in front of us with some angry shrieks. “They don’t like visitors! We might be venturing into their peaceful existence with the motorboats, mobiles and flashing cameras.” I said in a guilty tone. The green murky water with an oily surface and one or two floating plastic bottles deepened my feelings. As I had briefed through the information before the visit, the study detailed the reduction of mangroves into half over the last five decades. “Don’t worry about that. We won’t take these rides on an everyday basis. And we don’t have more than two rides in a day. You also cannot go into the deepest part of the mangroves as there a chance for the boat to get stuck into the mud. The birds are peaceful there.” Muneer tried to justify our actions. 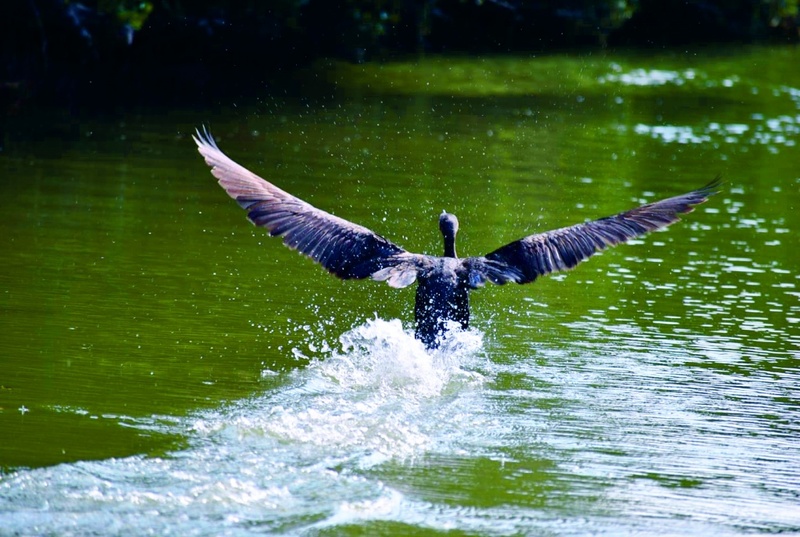 He steered the boat back to the entrance of the mangroves and that’s when a Cormorant came before us. 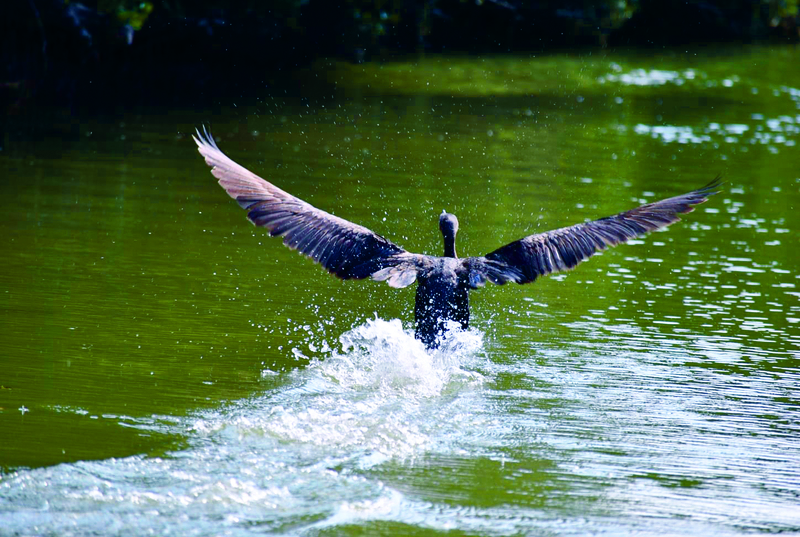 He flapped and ran in front of the boat with shrieks and flapped ahead us. It dived under the water on frequent intervals and appeared a little ahead on the way. It didn’t even bother to scoop out from the shallot of fish or shrimps that floated abundance under the water. As we came near the entrance, it dived under the water again and as we looked back, it went back into the mangroves with relaxed strides. “It really wanted to see us out!” I exclaimed. The outline of Bahrain gleamed at horizon across the twinkling waters and the clear blue sky. It was a dream short lived and we would love to go back there even if we upset some of the dwellers.